See the best of Rome on a guided visit to its most iconic symbol, the Colosseum, followed by a journey through the heart of the Empire with the Roman Forum and Palatine Hill. Hit the streets for a walking tour, with the Spanish Steps, Trevi Fountain, Pantheon, Piazza Navona, Gladiator school and more. 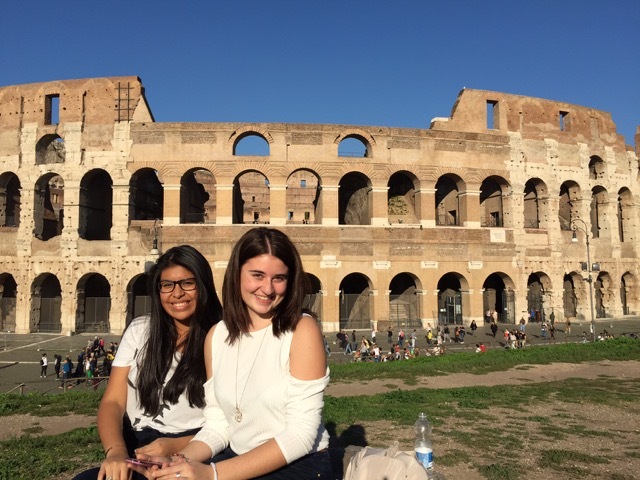 Attend a local Italian high school, live with a great Italin Host family in Turin and go to school with the locals and make life long friends. Live with a local host family while you enjoy a full immersion with a genuine Italian family to improve your speaking skills. Delicious local gelato, pizza, have a cafe with friends and improve your speaking skills with teenagers your own age. This is a beautiful town with a flavour or history, architecture and culture. Enjoy a walking tour and visit the famous Rialto bridge, San Marco square. See the demonstrations of the world famous Murano glass blowing. While soaking the local flavours and aroma of pizza and pasta. Hotel is just a short walk to everything and you are right in centre of Venice. Great souvenir to take home. Last day of your great adventure includes a tour of beautiful Milan. Take a group photo in front of the worlds most beautiful Cathedral and most as you continue on and stroll through to the famous La Galleria with the beautiful Dome glass roof of many colours. Jump on the famous Milan double decker red tour bus to discover Milan city. What will I gain from joining this high school Italian study tour ? This will be one of the best adventures and study tours you of your life. You will have the experience of full immersion into the cultural, people, food and life. You will improve your speaking skills when you speak with local students your own age while attending an Italian High school. You will learn more about the culture and eat the most delicious traditional foods you will ever taste. Learn the secrets of the best kept secrets in our hands on Italian Cooking and Chocolate tasting at its best. 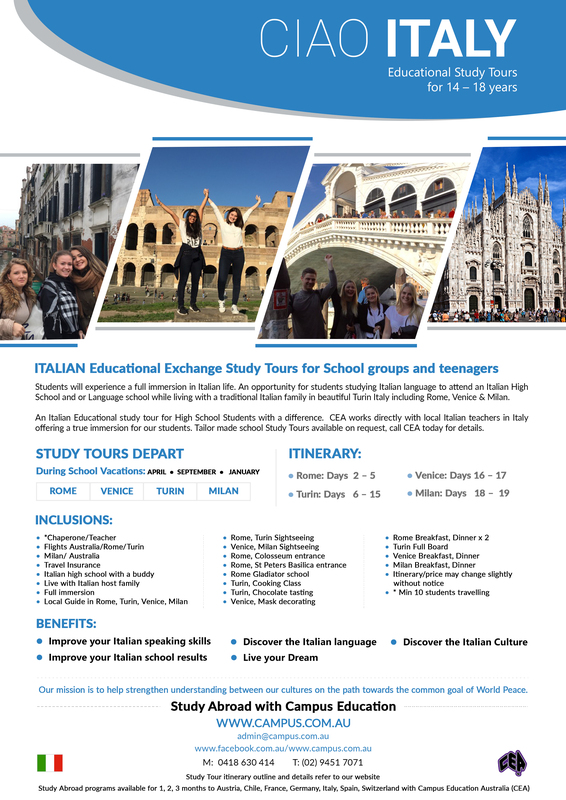 You will return back to school with a new insight, passion and excitement of the Italian language and this will help you excel in your class and your exams because you have lived the dream, spoke Italian language and culture and enjoyed the food to and this passion will go from your head to your heart. Discover a language and Discover the world. To improve my Italian speaking skills. Experience living with a great local Italian host family. Attend a local Italian high school. Broaden my global social network. Live and speak the language with local teenagers. See famous Icons we always discuss in class. Live the dream and see the world. How many students do I need? achieve the numbers. Opportunity for all students. Can I go at any other time ? Do you have a budget you need to work with? CEA has been operating since 1998. We are boutique organisation offering professional and quality study tours. to ensure that your students will attend excellent high schools experience a true immersion and live with quality host families. Families are all security screened and all homes personally inspected by our coordinators. Are you looking to take a group of your school students on a Study Tour Abroad on a true cultural experience? We offer a personal, quality and professional advice and guidance. Please complete the enquiry form below for CEA to assist you to accomplish your group goal for a Study Abroad Cultural Experience. Contact CEA today on +61 2 9451 7071 or +61 418 630 414 — SKYPE ID campus education australia jenniferdeflorio — WECHAT jenniferdeflorio Education Australia — 0418630414 for advice and suggestions. What is the Main purpose for the group to travel and what is the goal you wish to achieve? Do you have any special requests, Sightseeing you wish to include?